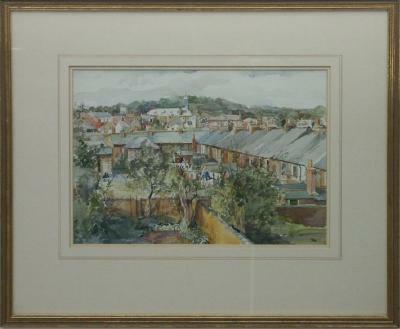 'Henley from above the town' by Lucy Cooper A gilt framed watercolour, window mounted in cream card. This picture shows a view down onto the rooftops and the church tower of Henley from across trees and fields. There is a large tree in the left foreground and hills in the distance. 'Jennings Wharf, Henley.' Framed oil painting by Ward. View ofJennings Wharf with the tow path in the left foreground and the tower of St Marys Church and the town behind. The Angel on the Bridge Pub is in the centre and on the right is the Henley Bridge and the Thames. 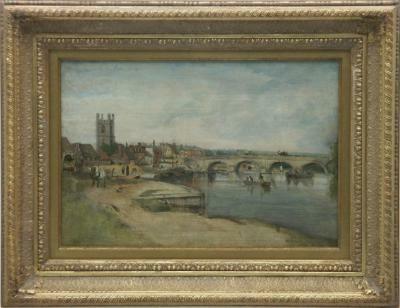 Framed study - View of bridge at Henley on Thames by Joseph Farington. 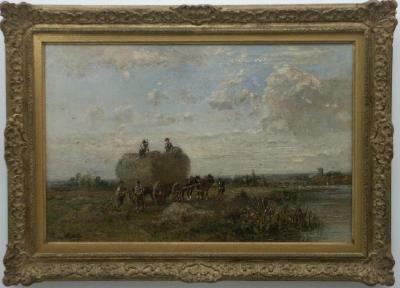 'Carting Hay at Henley' An oil on canvas painting painted by Alfred Bennett in 1883, depicting a horse-drawn wagon, full of hay with five farm labourers. Two are on the ground in front of the wagon, holding pitch forks and a hay lifter. Two are on top of the hay in the wagon, holding pitch forks and patting down the hay. One is stood by the horse's head. 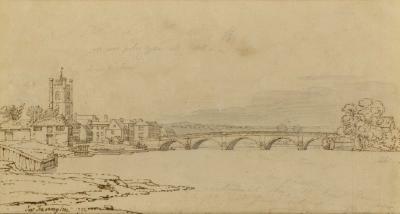 The wagon is in the middle of a field, the Thames is on the right, Henley in the background and Henley Bridge to the left. A watercolour painting, looking over the rooftops of Henley towards the Town Hall from Queen Street, by Tom Coates in 1980. 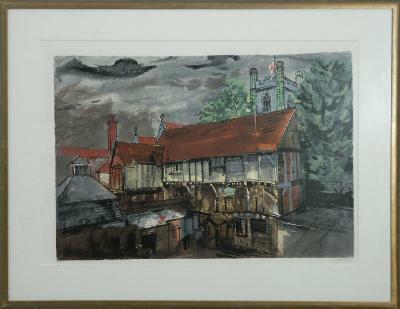 'Chantry House, Henley' by John Piper dated 1983. A framed coloured limited edition screen print, signed and numbered 95/100. The Chantry house is a medieval timber-framed building adjacent to St Mary's Church. Probably originally a Merchant's House it has storage on the ground floor opening onto the riverside wharves, a middle floor opening into the present churchyard and an upper floor. It was later used to house the King James' Grammar School and the Dame Perriam Bluecoat School. 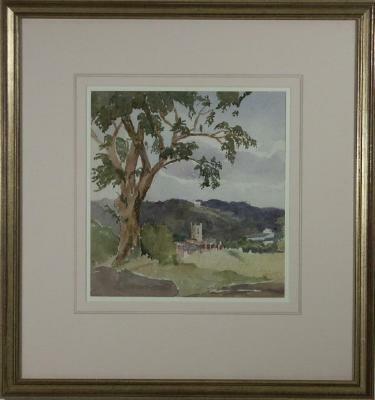 Framed watercolour painting. 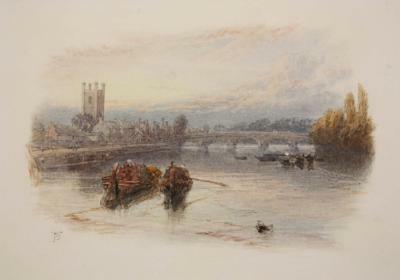 A view of the Thames at Henley on Thames by Myles Birket Foster. Postcard featuring a reproduction of "Carrying the boat", an oil painting by Michael Murfin in 1983. 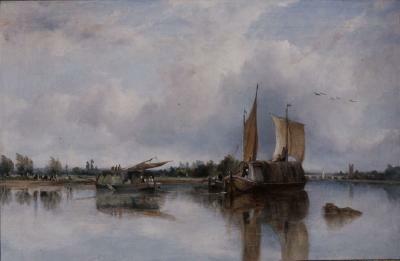 'View of Barges on the Thames with Henley Beyond' by Frederick Watts. Framed oil on canvas. River scene with the river in the foreground and three barges in the centre. The large barge to the right of centre has a covered deck and a figure at the helm to the rear, and is reflected in the water. There is a smaller barge under sail beside it and on the left of centre is a fully laden barge nearing the bank, where there are horses and some figures on the tow path. In the far distance on the right is the bridge and spire of St Marys Church in Henley-on-Thames. 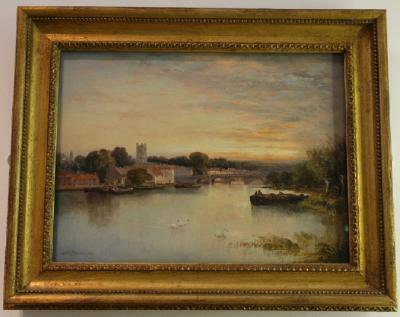 This is possibly the painting entitled Barges on the River Thames at Henley, exhibited at the Society of British Artists in 1839 (no.491) (cited in ‘Works exhibited at the Royal Society of British Artists 1824-1893’ vol2. 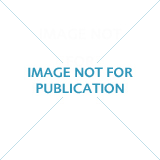 P. 489). Purchased by the Museum with grant assistance from the Resource/V & A Purchase Fund and Sir Harry Djanogly CBE..